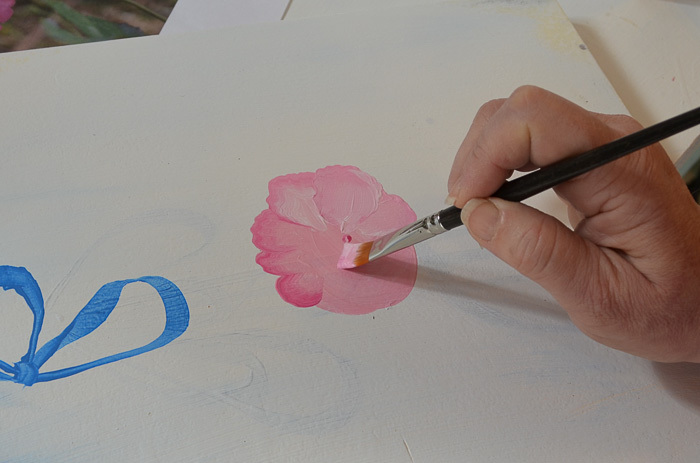 How to Paint the Back of a Rose, I show you step by step how to capture roses that face away from you in a bouquet or design. 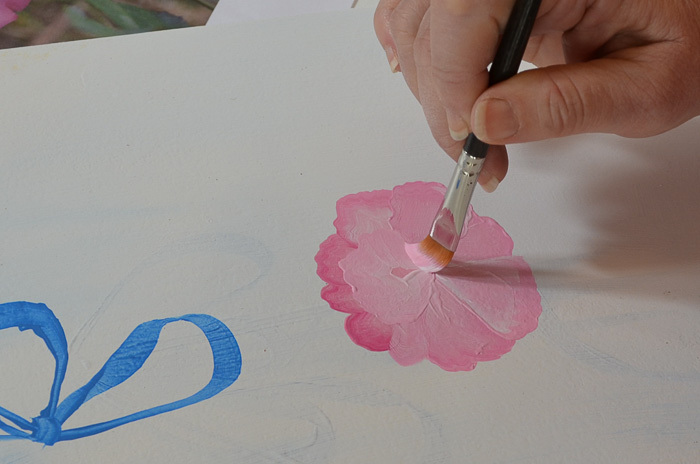 Learn How to Paint the Back of a Rose on stroke at a time. Easy enough for beginners and fun for everyone. 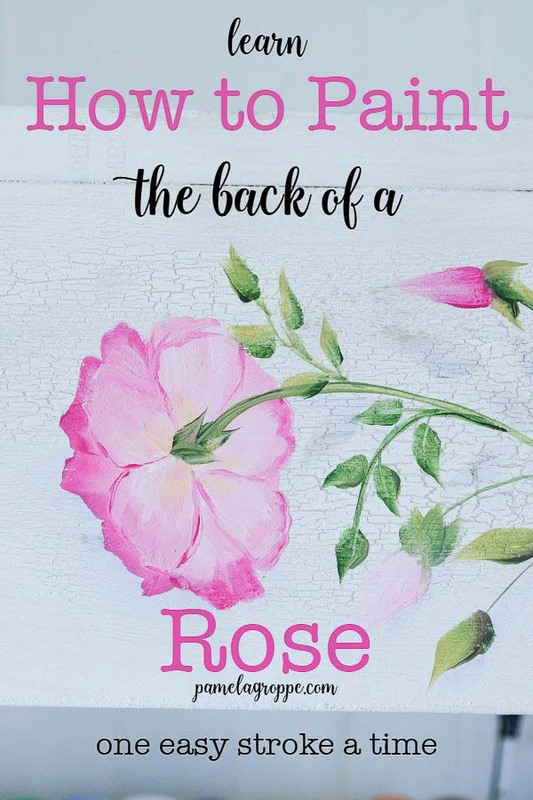 Let’s get started painting the back of a rose. I used a bench I did a tutorial Here: Sweet Heart Bench. 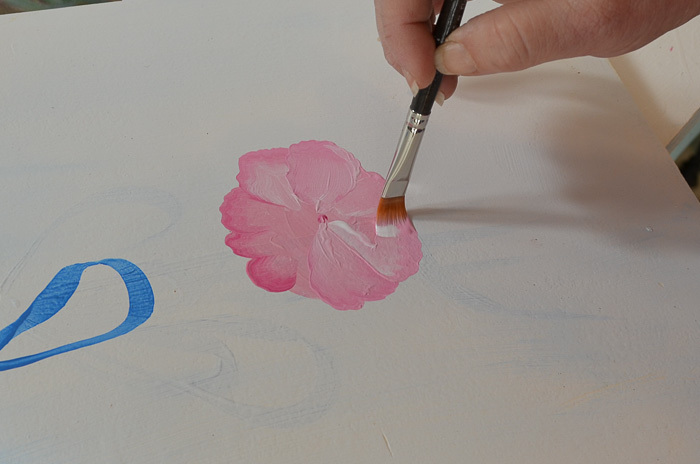 Start with basing in the shape of your rose back in Baby Pink with a #12 Flat Brush. A simple ovalish shape is fine. I have dug out my Masterson’s Stay Wet Palette to use. It keeps the acrylic paints moist and is helpful. I had forgotten how helpful. 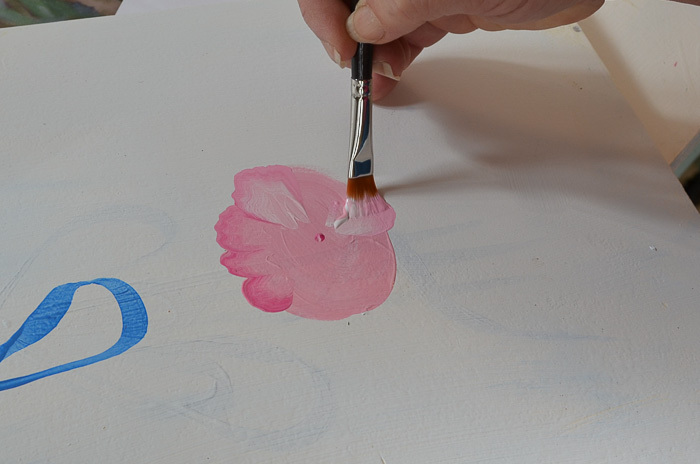 Paint in the back petals of the design using a double load of the Fuchsia and Baby Pink, the Fuchsia on the outside edge. 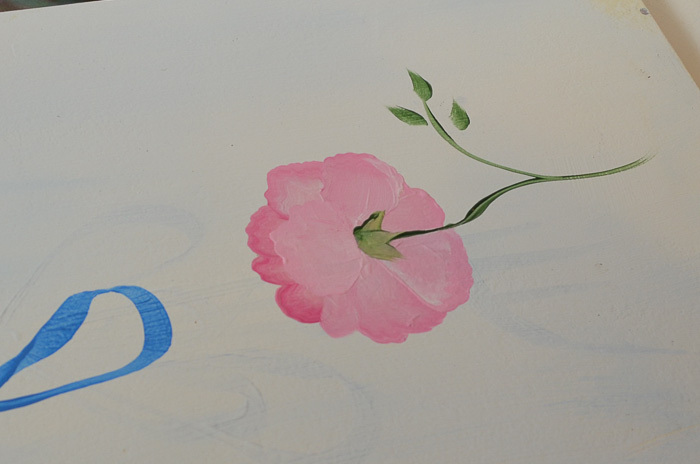 Next paint the side and lower petals overlapping them as you go. You can see a dot in the center, all your petals should aim for this dot or maybe a better term would be they radiate out from this point. 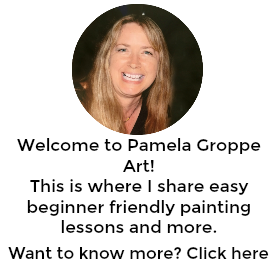 The video at the end of this post is most helpful in letting you see that. I build the petals around, I highlight some with the Titanium white as I progress. Keep building or layering the lower and side petals until you have come full circle. 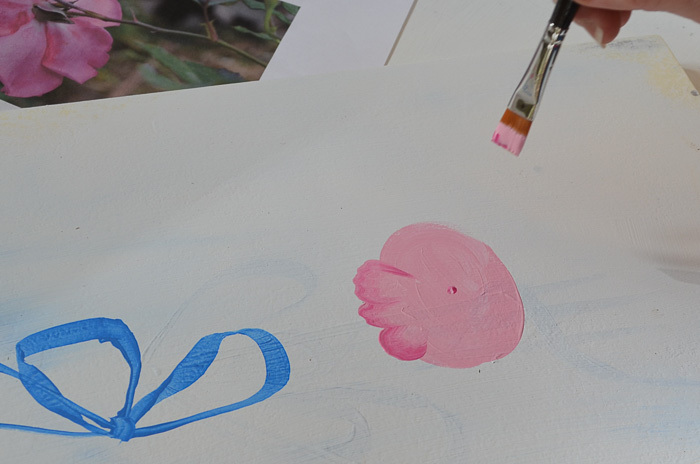 Then with your brush double loaded with the Baby Pink and Titanium white add the upper petal that overlaps the under or back petals. You can add a touch of Fuchsia here and there as you wish to add contrast. 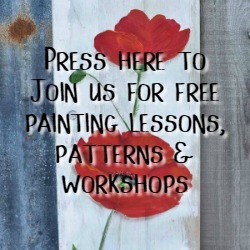 Load a #6 flat brush with the Evergreen and paint on an upside down triangle shape where the dot was in the center. This is your stamen. And there you have your back of a rose. 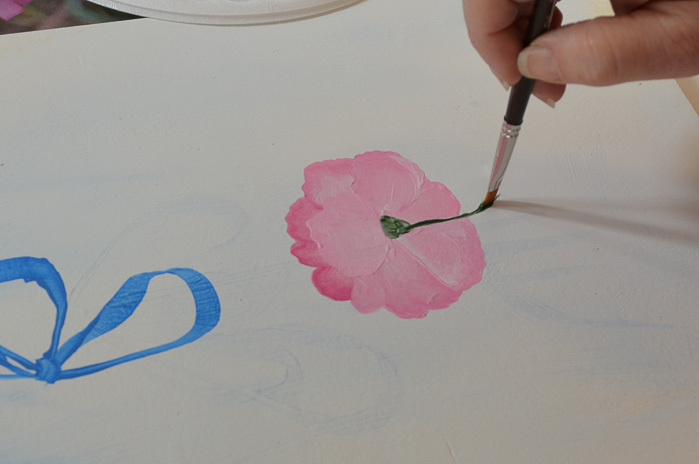 Add this with the rose painting tutorials you have under your belt!